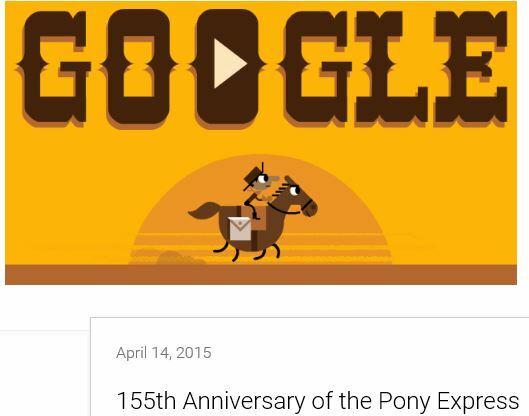 Apparently I chose the wrong anniversary to celebrate when it came to the Pony Express. I marked the 155th anniversary of the mail leaving St. Joseph, Missouri and Google celebrated the 155th Anniversary of those same letters arriving in San Francisco. It’s OK, I’ll enjoy it twice. I know I eluded to in my post on April 3rd, but today I heard it stated as clear as it could be. I mentioned that I wonder if I would have had, or if I have, the grit to be a rider. Today I heard it remarked that the biggest reason that the Pony Express Legacy lives on, is because deep down inside, we all wish we had done it. Yessir, I do. I wish I had done it. I’m afraid I wouldn’t have, but I wish I had. One day, up there, when we’re all sitting around talking of our earth days, I’m going to hunt down one of those riders and listen to his stories and live the experience by proxy. I know that some of these fellas may have been a little rough around the edges, but if my God is who I hope he is, Pony Express riders will have a free pass into heaven, just for the hell of it all.